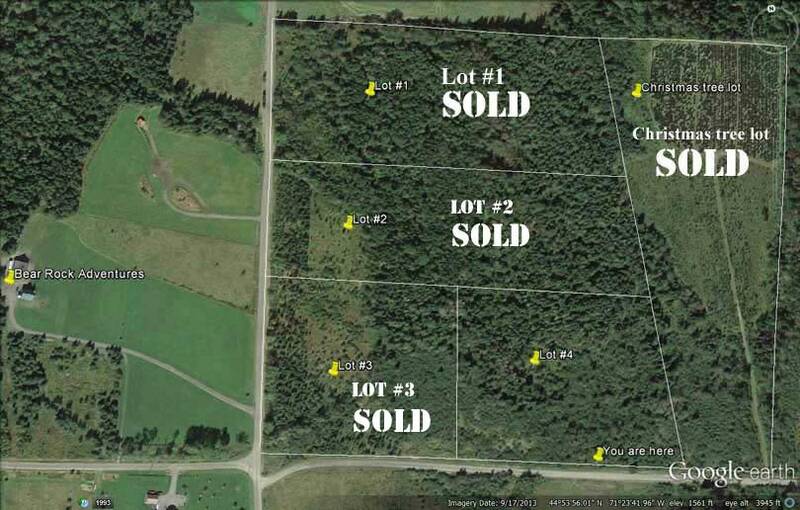 Christmas Tree Lot-	SOLD 12 acre lot with 400 ft. of road frontage on Cree road. About 10 acres (12,000 trees) of growing and maintained Christmas trees in 4 different stages of growth. High ground with beautiful views of the mountains toward back of the lot. Beautiful property for a couple or family to build a home and have a small Christmas tree farm! $84,000 without the trees or $134,000 with the trees. All the property is in current use so the taxes are very low. The lots are in the process of being subdivided now and the building lots will be cleared by this fall. Owner financing is available with approved credit and down payment. If you have any questions please call Jay Weir - 603-481-0192.